When Macada Innovision was established in 1996, the company specialized specifically in rear screen projection. Today, we supply all kinds of projection systems – rear screen, front screen and interactive. You are at the right address for complete projection systems, but also for the component parts: projection screens, projectors, mirrors, frames and accessories. In recent years, we have also focused on the sale of mirrors for a large number of applications. 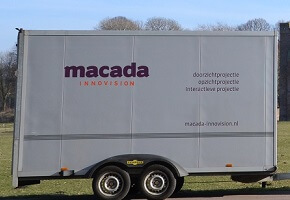 Macada Innovision was established as a family company and we remain so. We opt for a personal approach: a made-to-measure solution for each customer.